In this article we seek to highlight the way in which technology is integrated into productive processes, given that – as the American economist Paul Romer has noted – research results are public property, and may be freely used simultaneously by two or more individuals. Moreover, increased knowledge can help to generate economies of scale that can lead to increasingly improved performance. The intensity of these improvements, however, is not always the same. The effects of innovation evolve in step with technological cycles. For example, during the First Industrial Revolution (1750-1830), the railroad was a great invention that definitively altered business relations. The first regions to enjoy rail service attained a significant comparative advantage, allowing them to grow at a much faster rate than their competitors. However, to the extent that the rail network expanded, this innovation became less important in terms of competitive advantage, eventually becoming a mature technology, i.e., it ceased to generate growing performance. This example can help us see how research is a continuous process, and how innovations move the frontiers of knowledge. At the beginning of an industrial revolution, new ideas are rapidly generated, given the general lack of scientific knowledge. As science continues to develop, researchers must spend more time educating themselves before being able to produce new knowledge. This is due to the fact that innovation is based on pre-existing technology. For example, internet would not have existed if scientists had not been able to support their work on electricity – a 19th century innovation. It becomes more and more difficult to innovate. As technology improves, identifying the needs that have yet to be met calls for a level of expertise and sensitivity that were not necessary in the early stages of science. Nevertheless, this growing difficulty does not mean the end of possible innovation. Moreover, it is possible to produce knowledge beyond the current limits by widening the field of investigation. These successive displacements of knowledge frontiers represent one of the basic aspects of economic growth: improved productivity. Accordingly, we might confidently say that the continuation of scientific research assures productivity and future economic growth. However, North American economist Robert J. Gordon offers an idea that dampens this optimism, claiming that we have arrived at a situation of long-term economic stagnation. Gordon believes that the greatest advances occurred as the result of the Second Industrial Revolution (1870-1900). During that time, animal-drawn transport was replaced by motor vehicles, coal gave way to oil and electricity, and sewage systems were developed along with water pipelines. All of these innovations boosted productivity, economic growth and social welfare. These changes, together with those resulting from the First Industrial Revolution, made it possible for per capita production in the United States to grow at a rate of 2% from 1981 until 2007. According to Gordon, the future at this point is not so promising, and we will not see a repeat of this growth rate. He states that from 2007 until 2032 – and even until 2047 – per capita production in the United States will grow by only 0.9% annually. Nor does he expect productivity to keep growing; he predicts a reduced annual rate of 1.3%. From this perspective, the future would appear to be less favourable. However, can we really be sure that the above predictions are correct, and that there will be no new growth prospects? In our opinion, we cannot. This statistic shows that innovation remains a factor in the so-called Third Industrial Revolution, which began in the nineteen seventies and continues today. The development of electronics, robotics, biotechnology and especially the globalisation of the internet have all contributed to ongoing productivity growth. 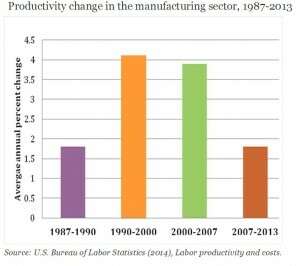 As can be seen in the chart, North American industrial productivity grew at an annual rate 4.1% between 1990 and 2000, a period of only ten years. 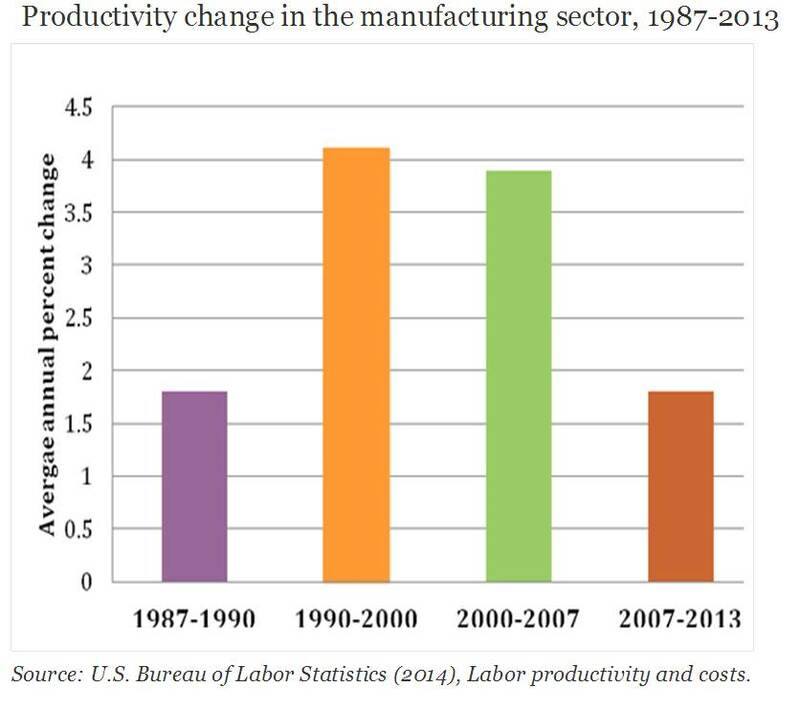 Moreover, this productivity growth continued up until 2007 at a rate of 3.9%. While it is clear that productivity growth rates have fallen over recent years as a result of the economic crisis (an increase of only 1.8% in the United States between 2007 and 2013), we do not think there are enough reasons to affirm that growth has completely stopped. Fortunately, scientific research has continued, and we now have new advances in transportation, with unmanned flights; in medicine, with progress in genetics; in 3D printing; and in the comprehensive integration of the internet in daily life, with “the internet of things”. The positive effects on the economy from these innovations will be seen when they are applied and extended throughout society. However, this transformation is not immediate. The life cycle of a technology requires a passage of time between the scientific discovery, the creation of the innovation and the spreading of the technology. Thus, the technical evolution of the First Industrial Revolution took a century and a half to run its course, and eighty years after the beginning of the Second Industrial Revolution its innovations were still boosting increases in productivity. This behaviour of technology cycles leads us to believe that the effects of the Third Industrial Revolution are probably not over, and that its innovations still have the capacity to generate future economic growth. Moreover, the recent crisis has slowed down the economic cycle, since companies cut down on investments in improving existing technologies and developing new knowledge via research and development (R&D) policies. Accordingly, we can expect that as the economy improves, the technology cycle will continue to evolve, allowing Third Industrial Revolution technological changes to complete their effects. In addition, researchers – who will be progressively more advanced and better educated – will continue to push ahead the frontiers of knowledge. This will lead to further increases in productivity, which will continue to act as the engine behind growth. In short, we expect that the future will continue to bring scientific advances that will open the door to greater levels of economic development and social welfare. Fuente: Rafael Pampillón y Cristina M. de Haro. “Technological advances will continue to spur World economic development“. Publicado en Forbes India.